Each day millions of people spend time in some sort of competitive gaming environment — whether traditional, video or social media games. Many are chasing specific trophies, scores and achievements, others play simply to interact socially with their peers. In any case, they are inspired to come back the next day and keep playing. Is it possible to leverage competitive gaming techniques to drive productivity and reduce risks like insider threats? Andrew Moore, lead researcher at Carnegie Mellon’s CERT Insider Threat Program, thinks so. In fact, two of the three points highlighted in ­­his March 2017 study pointed to job engagement and connectedness at work, both of which can be significantly improved by effective gamification strategies. In an increasingly volatile and ever-evolving digital landscape, an engaged workforce can mean the difference between a department’s success and its stagnation. The organization as a whole sees a variety of benefits from gamification. Obviously, a dynamic workforce is superior to a static one: Gallup found that employees who are actively engaged in their day-to-day responsibilities and their organizations’ overall objectives are more productive, less likely to be absent and less likely to leave the company for another position. The reasons to enable gamification go beyond that, however. 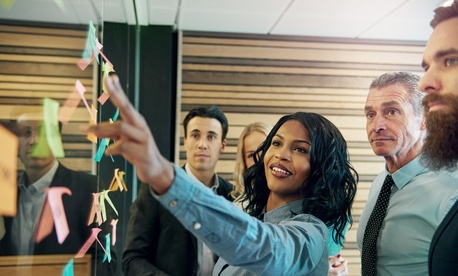 By enabling and encouraging collaboration between employees and contractors from different departments, organizations can break down silos that inhibit real innovation and productivity. Tearing down silos often results in cost savings by increasing the velocity to market while reducing management overhead. Furthermore, it ensures the whole agency is on the same page regarding goals, analytics and objectives. Also inherent in gamification is the ability to track status. In many gamification strategies, employees are in fact encouraged to input their progress each day. Once an organization is collecting that data, it can analyze it to make better-informed, data-driven decisions. Demonstrating progress and innovation could compel the federal government to reallocate resources or retool specific objectives. Whether you are building a “serious game” to drive a key initiative within your teams or applying gamification broadly to your workforce, implementation of any gamification strategy should be strategic. It is easy to slap badges onto achievements and assign points to specific tasks, but without adequate thought and preparation, the new strategy may become the equivalent to a board game that sits in the closet. Organizations need to first discover what specific goals they have for the program and what metrics or analytics can be used to keep track of the program’s progress. Additionally, managers should consider what will truly motivate their employees, or in this case, their “players,” as different types of players will react positively to different game mechanics. Determining what player types make up your team, and what attracts them to different tasks, goes a long way in finding out what mechanics will best keep them involved in the game. In April 2016, GSA released an article revealing how the Navy was trying to solve difficult open-ended problems through MMOWGLI, short for Massively Multiplayer Online Wargame Leveraging the Internet. Through the online gaming platform, an open-ended problem is presented and players collaborate on potential solutions. Players receive points by submitting solutions, when other players react to their submissions and for solutions that the game masters find particularly creative. A leaderboard tracks who has received the most points, and solutions created in the game can be put into practice in the real world. Government agencies such as the National Aeronautics and Space Administration (NASA) and the National Oceanic and Atmospheric Administration (NOAA) have employed gamification techniques to solve complicated problems as well, showing progress and boosting their public profiles during budget negotiations. NASA’s Moonbase Alpha was even released as a free game to the public, garnering much acclaim. Gamification is not some Silicon Valley buzzword, and the public sector should not ignore it. In light of looming budget constraints, the benefits of an active workforce are significant, and the detriment caused by employees who are not engaged even more so. By applying gaming concepts strategically to career and organizational development, HR departments stand to increase productivity, encourage collaboration and spur innovation.